The last L5R book ever? A couple of years ago, the fourth edition of L5R was brought to my attention by the eternally excellent Happy Jacks RPG podcast. This crew of Californian gamers, about my age, filled their weekly podcast shooting the breeze about roleplaying, drinking beer, burping and reading out listeners’ emails. With L5R, they tried an experiment – recording their game, and podcasting it, unedited, occassionaly between regular episodes. There’s a whole genre of this sort of podcast, called Actual Plays, but the idea was new to me back then. To be honest, it spoiled me. Their L5R Actual Plays were somehow incredibly listenable, in a way that most of the others I tried listening to, from Happy Jacks and other podcasters, simply don’t manage. I put that listenability down to the game itself. While it can be incredibly violent, much of L5R is concerned with working out what the right thing to do is, given the competing imperatives of personal honour, loyalty to your clan etc. Each game thus comes down to the players, in character, discussing the right thing to do, and those discussions can have all the dramatic tension of a scripted drama. As I type, I’m trying to listen to a Happy Jacks’ D&D 5th edition actual play, and it simply isn’t as compelling. With the L5R podcast, the Happy Jacks crew were learning the system as they played, so much of the conversation was about how the rules worked. The “roll and keep” system the game employs was intriguing – the player rolls a number of d10s, and choses to keep a subset of what they rolled based on their stats. Most of the time, of course, they keep the top scoring dice, but not always. The ability to chose to fail is an important factor in a game where failing might well be the honourable thing to do. By coincidence, DriveThruRPG.com was had a sale on L5R PDFs. The sale price was VERY good, something like 75% off, which I’ve never seen repeated, so on whim I decided to pick up the core book. For a start, the PDF was gorgeous, in the style of moku-hanga woodblock printing and kaiga painting, and illustrated (I assume) with the vast library of images created for the card game. All this is paired with excellent typography. Beautiful, evocative and clear, almost perfect RPG graphic design. So good, in fact, that I went out and bought a hardback copy as well. The system itself is more complex than some modern games, like Fate and Gumshoe. It features classes (clans and schools) and skills, and character creation involves a deal of maths. Combat (both physical and social) involves more than a few rolls. But it works! And fits the world and the genre perfectly. I had no intention of running the game when I bought that PDF, but having read it through, I ran the sample adventure at the back game for a couple of guys at my local club. It was a perfect introduction to the world, and they wanted more. I had no time to create adventures so I scoured DriveThru for a couple of 4th ed scenarios and, when they were done, bought and adapted some third edition adventures. The group grew to eleven players at its peak. I wanted to play too, so badgered someone else in another group to GM. I was a convert to L5R. Then, late last year, the publishers AEG announced they were going to concentrate on board-games, and were selling L5R to Fantasy Flight Games (FFG). FFG in turn announced that they there very excited about the setting, and would be releasing a new “Living Card Game” in 2017. They also said they’d “explore new possibilities for L5R in the roleplaying space.” I don’t hold out much hope. FFG have merged with the the North American arm of Asmodee, the European producer and distributor of boardgames. Already most of FFG’s output is boardgames, miniature games and card games (some very good ones, I love me a game of X-Wing), and their most successful RPG is Star Wars. I can’t see them getting round to L5R RPG for some time, and even then, I can’t see them retaining the roll-and-keep system which I have come to love. It’s somehow fitting then, that the very last book in the L5R 4th Edition line, and possibly the very last book ever for any L5R RPG, details the setting of Rokugan, and in doing so charts the 20 year history of that setting’s development through card game and RPG as much as its millennia-long fictional history. The Atlas of Rokugan has no mechanics, so ironically it’s not really a supplement for the RPG at all, but a general guide that works just as well for players of the card game. But it comes with the RPG brand, and so is just as beautiful as all the 4th edition books. 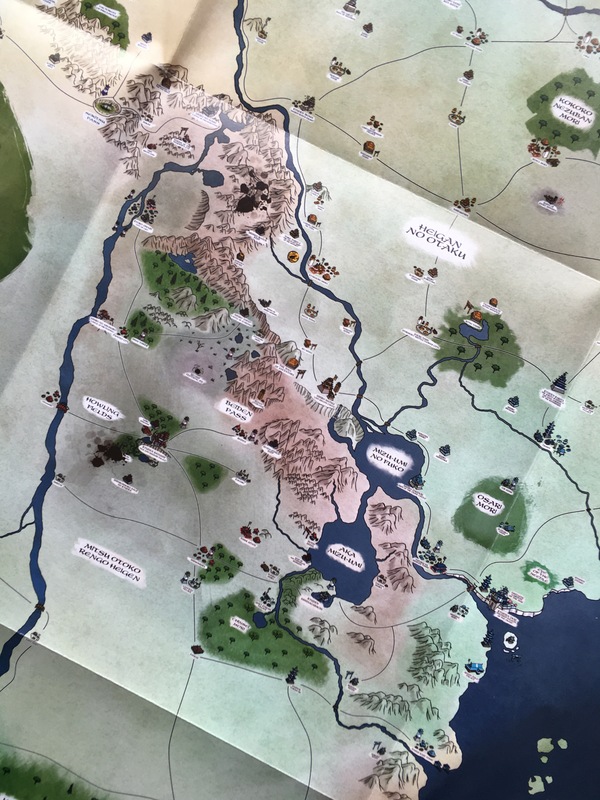 Inside the back cover, you’ll find a folded map of all of Rokugan, 60x80cm, that is a million times better than the dreadful, frankly almost useless map in the fourth edition rule book. Every settlement and location is clearly labelled rather than the code numbers the rule book uses. Routes between the settlements are also marked. The glue that keeps the map in the book is of the sort that temporarily fixes your new credit cards to the letters they send them with, so it’s easy to detach from the book. Sadly, the glue does leave a couple of greasy stains on the map. Inside, sections of the map are reproduced at the beginning of each of the first eight chapters, to show each clan’s holdings. Each province is also reproduced within the chapters, often blown up to fill a page. This makes all the labels (some of which are impossibly small on the fold out map) readable. Key buildings and landmarks are often illustrated, and some buildings also get floor plans. The floor plans aren’t scaled for use in play, with figures, and they aren’t labelled in any great detail, so they act more as inspiration for the GM, than a useful tool for play. There’s plenty of text in each chapter too. Giving a brief history of each place. This “travelogue” style history is something I love. I find deeper history and RPG fiction tiresome, to be honest. Something that makes Rokugan unique, is that it’s history is determined by players of the card game ad the regular tournaments that AEG ran. The winners of each tournament got to decide which way history would turn in the next few sets of expansion cards, and in the official history as represented in the RPG. Which makes for deep history, but also an overwritten one. That’s said the text in this book is enough to inspire, while leaving space enough for GMs and players to make the Rokugan of their imaginations. The lands of the minor clan are all bundled into one chapter, as are unaligned lands and those run by imperial families and monks. There’s another chapter each for the Shadowlands and the Shinomen forest. Just glancing at the this last chapter inspires me to run an expedition there. The book closes with three chapters on the three great cities: Otosan Uchi; Ryoko Owari; and Toshi Ranbo. All in all, this feels like the perfect last book in the line. It’s as though AEG have said “this is where Rokugan stands, at the end of our tenure as guardians of the story, do with it what you will.” There’s a certain elegiac quality to the writing, despite it being written for the most part in the present tense. Should you buy this book? Well first of all, can you? I found it quite difficult to get hold of. It sold out pretty quickly at my favourite London game shop. It’s not available on line (except overpriced second hand editions) and when I asked my local store if they could order it, there was some sucking of teeth (though it arrived within a couple of days). So assuming you can find it, then should you buy it? If you fell in love with L5R and Rokugan like I did, then yes you should. I’d go so far as to say if you only buy one book apart from the L5R core book, then it should be this one. * The honourable exception here is Feng Shui, which is fabulous, and incidentally, didn’t actually have its roots in the Shadowfist CCG. Feng Shui was conceived before Shadowfist, but Shadowfist came out first, because the publishers thought a CCG had more commercial potential than a RPG. Those publishers went bust by the way.